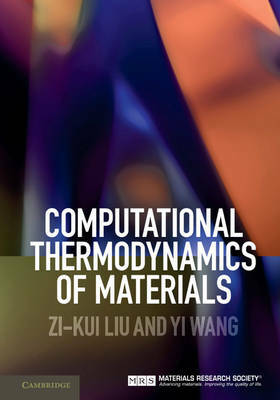 This unique and comprehensive introduction offers an unrivalled and in-depth understanding of the computational-based thermodynamic approach and how it can be used to guide the design of materials for robust performances, integrating basic fundamental concepts with experimental techniques and practical industrial applications, to provide readers with a thorough grounding in the subject. Topics covered range from the underlying thermodynamic principles, to the theory and methodology of thermodynamic data collecting, analysis, modeling, and verification, with details on free energy, phase equilibrium, phase diagrams, chemical reactions, and electrochemistry. In thermodynamic modelling, the authors focus on the CALPHAD method and first-principles calculations. They also provide guidance for use of YPHON, a mixed-space phonon code developed by the authors for polar materials based on the supercell approach. Including worked examples, case studies, and end-of-chapter problems, this is an essential resource for students, researchers, and practitioners in materials science.